Lorelei Williams is a participant of the Indigenous Women in Community Leadership program, looking forward to graduating later this month. She is the Women’s Coordinator for the Vancouver Aboriginal Community Policing Centre in British Columbia, Canada. 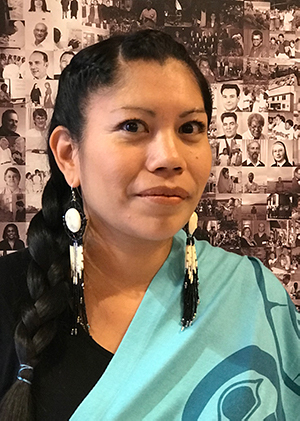 “[I work] with families of missing and murdered Indigenous women and girls, women in violent situations, and women in the Downtown Eastside,” Lorelei says. Currently completing the mentorship and community engagement phase of the program, Lorelei has been working to develop a line of educational resources aimed to improve safety for women and girls. “As a family member of both missing and murdered Indigenous women, I do what I can to raise awareness of this issue so this doesn’t happen to more families. As part of International Development Week (Feb 3-9, 2019), and every day, we thank Lorelei and all who work “together for gender equality”. Want to learn more? Sign up to receive our newsletter and information on course offerings.